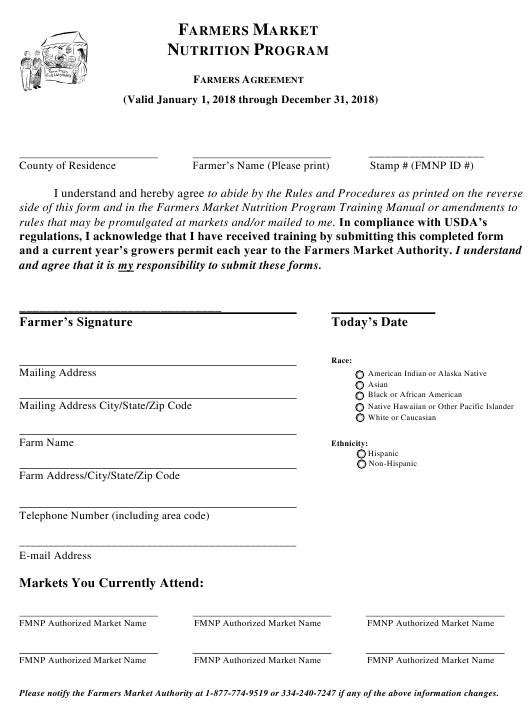 This printable "Farmers Agreement Form" is a document issued by the Alabama Department of Agriculture and Industries specifically for Alabama residents. Download a PDF of the latest edition of the form down below or find it through the department's forms library. and agree that it is my responsibility to submit these forms. Please notify the Farmers Market Authority at 1-877-774-9519 or 334-240-7247 if any of the above information changes. that you are eligible to accept FMNP checks.  Only a bona fide producer of fresh fruits, vegetables, herbs and honey can be certified for the FMNPs.  First time participants must receive interactive (face-to-face or web-based) training on program rules. agreement and growers permit prior to accepting FMNP checks. grow themselves. Honey is not an eligible item in the WFMNP! 3) permission is granted from the FMA. items, or items not produced on local farms. otherwise processed, heated, or cooked.  Checks cannot be exchanged for cash, cannot be used to buy produce from another farmer or given away. Jan 1, 2008, the disqualification will be permanent.